Two forces collide in this release. First, there’s Ascetic House, the label which recently released a 15-tape set, including this one (individual copies are still available). Then there’s City, whose album A Goal is an image was one of our top electronic releases of 2017. We’ll begin by talking about the label. Releasing a set so big is a gutsy call, but the risk paid off as the series sold out in less than a day. Receiving these tapes must have felt like Christmas. While we’ve only heard the public samples of the other releases, the standouts seem to be Kali Malone’s Organ Dirges, a reissue of Rabit’s hard-to-find Supreme, and Only Borders. The presence of Rabit demonstrates only one degree of separation from City, as both appeared on Halcyon Veil in 2017. When we reviewed A Goal is an image, we mentioned the fact that the album grew out of a 20-minute mix titled Arcadia. Turns out that was the second of four similarly-sized mixes, following Simulation Mix and preceding Guts for Garters ’17. All can be streamed on City’s Soundcloud page. The artist admits that there’s “a lot of overlap” between mixes, and that elements frequently appear on fuller productions down the line. But it’s a perfect way to get the ideas out there: song snippets, iPhone captures, seeds and dendrites. “Ffaith” in particular makes a few appearances, the latest on Only Borders; it’s hard to miss that 5-note motif once you’ve heard it. The fun of these mixes is that they provide insight into the artistic process. Will Ballantyne collects sonic fragments like poets collect phrases or quilters collect scraps. Some pieces inspire other pieces, some are used in collages, and some simply await their time. It took two years, for example, for slices of City’s Simulation Mix to wander their way onto an album. “Pain/Power” popped up at the end of the first two mixes before surfacing. In like fashion, we may be hearing echoes of Only Borders in 2020 or beyond, which makes the tape a time-traveling exercise. Has it been beamed to us from the future, or the other way around? “Ffaith” is an indication that a track may continue to evolve even after its “fixed” definition. Think of the 22 tracks of Only Borders as spices, not confined to a single dish. Update: We have it on good authority (City himself) that our wish is about to come true! 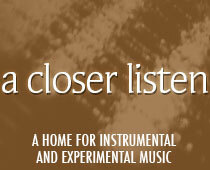 Keep an eye on Bandcamp, where soon you will be able to purchase all four mixes as a collection.